I lost track of Sylvan Migdal after he wrapped up Ascent, and only recently stumbled upon his current works. Spork is just a collection of, well, random stories, and while some of them are a bit less focused, they tend to have his usual charm. Which is to say, they have that element he is supremely good at – blending the slightly surreal with aspects we all recognize in our daily lives. For myself? 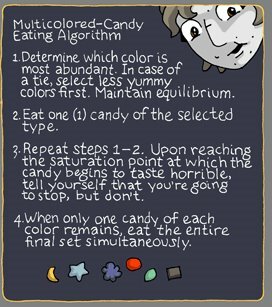 The multi-colored eating algorithm, and the acute agony of trying to ride a bus, are so damn true I couldn’t believe it. That’s how you connect with an audience. If you want to draw them into your world, nothing does it quite so well as making them realize it is their world too.